Just 18 months after graduating high school, Emily Ogle will hold a University of Cincinnati bachelor’s degree in her hand — thanks to an early start at UC Clermont College. While still a junior at Milford High School, Ogle enrolled full-time at UC Clermont through College Credit Plus, an Ohio program that allows high school students to earn high school and college credit at the same time by taking college courses at community colleges or universities. The state program is free for students and their families. By the time Ogle graduated high school in spring 2017, she had earned 72 college credit hours. But credits weren’t the only results from her time at the college. For Ogle, those opportunities included writing for the college’s student newspaper, The Lantern, and working as an English tutor and supplemental instructor. But for an ambitious student who came to UC Clermont with an intense interest in science and medicine, the most important connection she made was with chemistry Professor Cliff Larrabee. Ogle first met Larrabee when he taught her general chemistry course. She soon learned about his ongoing research exploring a theoretical delivery system to more effectively target chemotherapy drugs toward cancer cells while leaving healthy cells intact. Ogle conducted research under Larrabee for several summers, presenting her findings in the summer of 2018 at the American Chemical Society Conference in Boston. The experience helped Ogle further define her education and career direction. Larrabee says that Emily's aptitude for the science was apparent from early on, and he is confident that she will achieve her dream of becoming a medical doctor who serves through Doctors Without Borders. "If I had to bet on one of my students saving the world, it would be Emily," he says. In December, Ogle will graduate from UC’s McMicken College of Arts and Sciences, where she served as a teaching assistant in general chemistry, with her bachelor’s degree in the field. 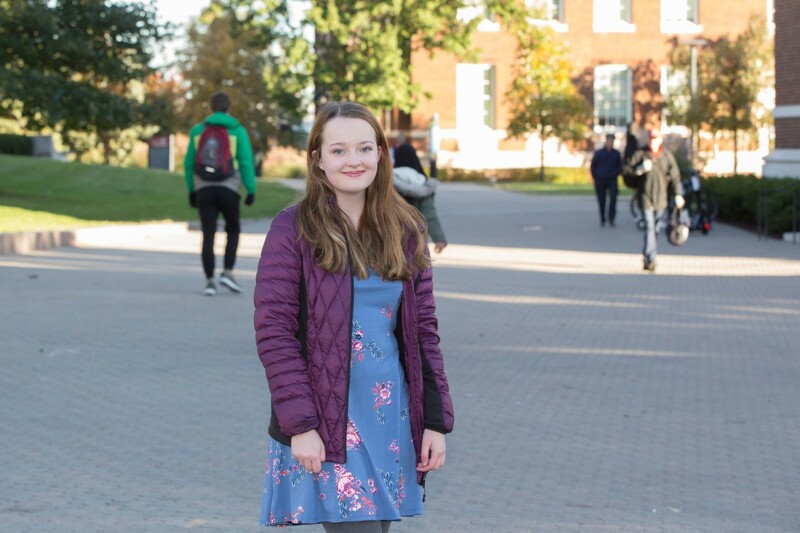 She is applying to be a Fulbright Scholar, with a backup plan to work in research or a hospital until she takes the MCAT and applies to medical school. All of it, Ogle says, made more possible, and sooner, because of the jumpstart she received at UC Clermont.